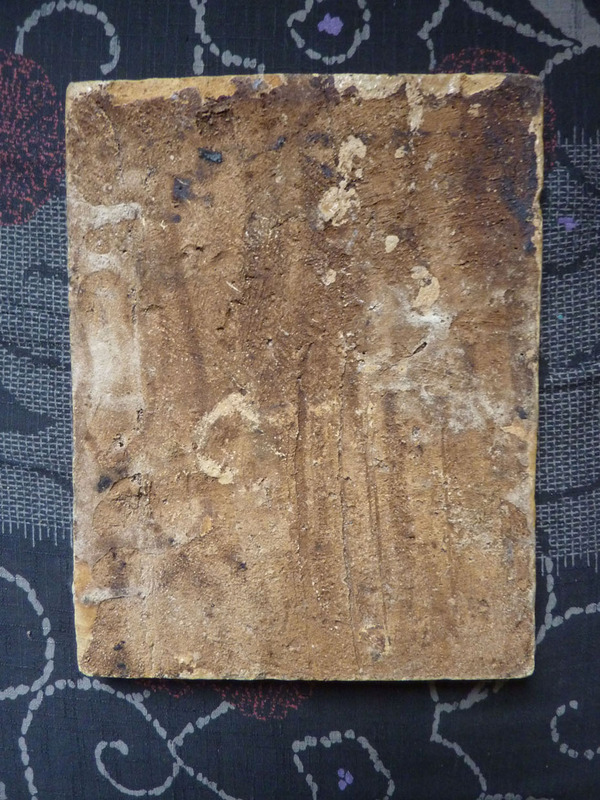 i PICKED THIS TILE UP THE OTHER DAY BECAUSE I THOUGHT IT LOOKED INTERESTING AND PERHAPS ANTIQUE. HOWEVER, I AM UNSURE AS TO WHERE IT MAY HAVE BEEN MADE AND THOUGHT IT MIGHT BE PERSIAN [BUT I'M PROBABLY WRONG]! ANY HELP TO IDENTIFY WOULD BE MOST APPRECIATED...! Thank you Naomi...it is difficult to age such things but i am guessing you are right and that its mid 20th century [possibly early 20th]? Are such tiles commonplace Naomi do you know? I certainly haven't come across such a piece before and find it quite charming...! It's near Eastern from the part of the middle east that borders Europe. Or from what is now Pakistan. It's probably not old. They are making these things today as decorative items. I do not believe they are intended to fool or are fakes but are done in the same style as much older items. Although the burnt parts could be looked upon as an attempt to fool. The dead give away on many of these is the design. Although they vary a great deal depending on how devout the ruler was when they were made. 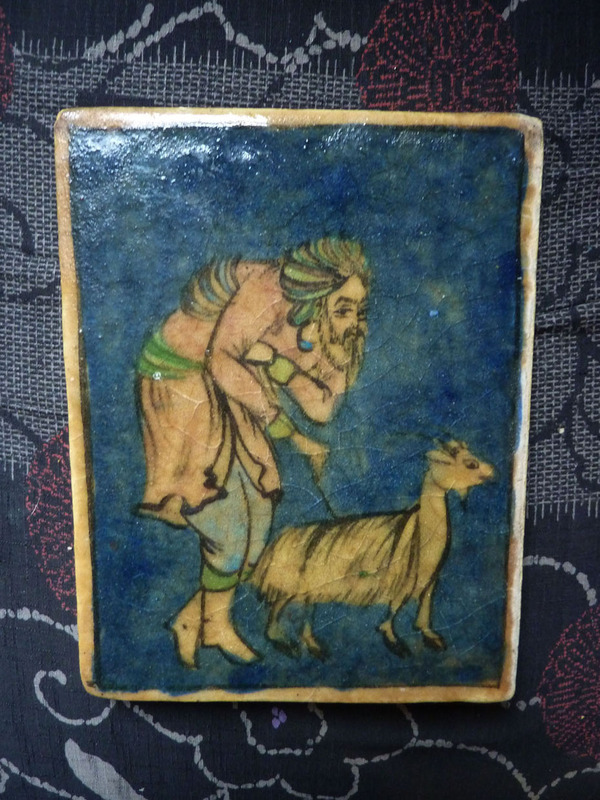 Persian for there own use tiles do not show living creatures like humans or animals. They best you get is a human with line across the neck to show they are not alive and this is only during the most liberal eras. Persian tiles are nearly always plants or design swirls of some type. I believe the avoidance of living creatures comes from the Muslim faith but don't have much information about why. Still we have a lot to thank these early artists for. Nearly every carpet, most dresses, many shirts and a lot of wallpaper has its origin in these designs. Many thanks Mordeep, that is most interesting and helpful....appreciated! I had heard from another source that Persian tiles do not depict animals and yet i've seen floral designs with birds incorporated that were 'supposed to be' Persian. Why the Muslim faith might avoid depicting animals [but not birds]? is a bit of a mystery to me and i suspect to others...! I learn something every day...! merlin wrote: Many thanks Mordeep, that is most interesting and helpful....appreciated! The simple answer is Persian tiles for Persians don't depict things that are alive. They get around that with various tricks in the image to show its not alive but only during periods that they could get away with it. Some eras were less strict than others. The other option of course is they were not Persian tiles at all but from regions close or made by people of different faiths.